Today, I pulled my mother’s steel soup kettle from deep within my kitchen cabinets and prepared to make soup. As I chopped and diced, my mind filled with memories of my mother standing on the parquet floor of our kitchen stirring soup over our stove. 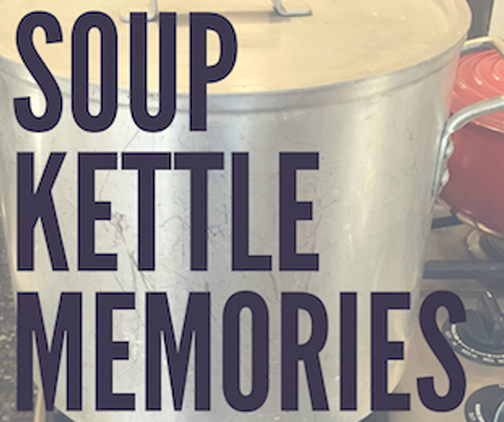 Each week my mother would pull out her hand scrawled recipes and fill her giant kettle with enough soup to feed our little family and to share a meal with a neighbor or a sick friend. After letting the hearty stock simmer all day on top of on our stove, she would ladle it into bowls and set them on our old wooden farm table where we would gather to eat and reconnect after a busy day. Today, as I stood over her kettle, my mind filled with memories of my mother standing before our brick stove over an enormous wok attempting to recreate our favorite Chinese food. I remembered the smell of my father’s favorite veal stew, that permeated every room of our house and drove me to play outside until she spooned it onto my plate. I remembered the brick red pattern of our kitchen wallpaper framed by sunlight streaming through patio doors and the speckled almond formica counter tops filled with carefully pressed Christmas cookies. I remembered watching my mother drop spooned out donuts into grease while I waited eagerly to roll them in cinnamon sugar and the scent of chocolate birthday cake that filled our house every September. I remembered the stories she told of my grandmother. As she chopped and diced, sauteed and fried, my mother told me that my grandmother was always the first one to bring a meal when someone was sick and the first to visit someone who was lonely or hurting. She told me that my grandmother lost her own mother as a teenager and raised her 3 younger siblings when she was not more than a girl herself. She told me that on the day my grandmother was rushed to the hospital she had been at the Veteran’s hospital visiting patients who did not have any family to tend to them. She told me how hard the last few months were watching her mom slip away and how much she wished I could have met her. I remembered watching my own mother’s life slip away as she became too weak to stand over her steel kettle or prepare our meals. On her last Thanksgiving, she gave me her apron and taught me step by step how to prepare our meal as she soaked up the warmth of the November sunlight that streamed across our kitchen floor. For three generations the women in my family have left their daughters behind to finish their growing, navigate the rocky path to adulthood and mother their own children without a mother to call for help or advice. They have left three generations of grandchildren to wonder what it would be like to know their grandmother. So today, I pulled out my mother’s steel kettle and I filled it with enough soup to feed my family and to share a meal with someone just like my grandmother and mother had done. While I stirred and seasoned, I told my children about my mother like she had told me about hers, and as the smell of soup filled the air around us, we longed for her together. That is a beautiful set of memories. I know it hurts to have her gone. You were and remain a blessed daughter. Thank you so much Christine! I agree that her legacy continues to be a blessing.